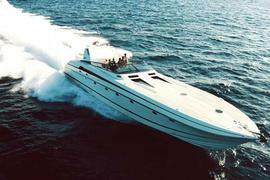 I call Jose Arana Jr at Fraser Yachts in Fort Lauderdale who confirms that he's now the central agent for sale of the 24.4m motor yacht Deep Blue. Deep Blue was built by Cherokee in 1999 to RINA class as a fast open top superyacht. She sleeps four guests in a master and double stateroom with room for two crew in a twin cabin and is powered by twin 1860hp MTU engines. Currently lying in Miami, Deep Blue is asking $995,000.